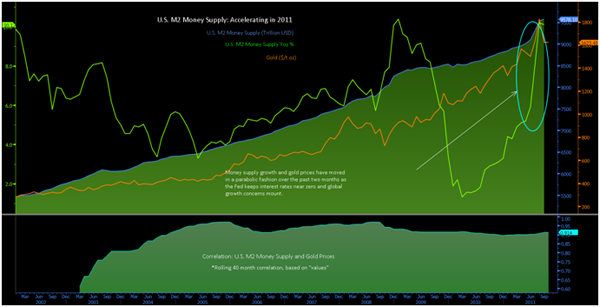 Goldbggr: $10,000-$12,500 Gold—Caused by Fast Rising Money Supply? $10,000-$12,500 Gold—Caused by Fast Rising Money Supply? 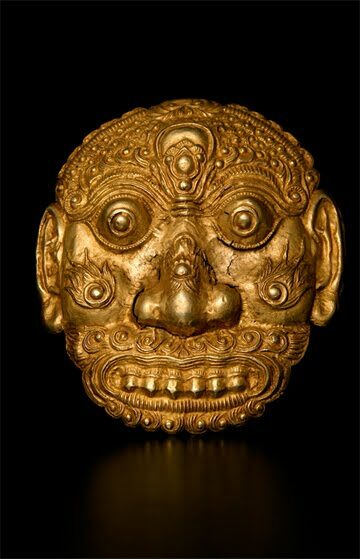 The future of the gold price rises as the real world (people like you and me—not the politicians, media or 'business leaders') recognizes the emerging shape and cost of the future in our badly financially damaged present. Demand from Asia is due primarily to concerns about fiat currencies – both domestic or local currencies but also the current reserve currencies of the euro and of course the global reserve currency, the dollar. While all the focus has been on the Eurozone debt crisis recently, the US is suffering a stealth debt crisis of its own which is being ignored - for the moment. As is the burgeoning debt crisis in China. The US fiscal position is appalling with a $1.6 trillion deficit projected for fiscal 2012 alone. For those who have lost count, the US national debt has risen to over $14.8 trillion. The latest updated projections reveal that the US will reach a 100 percent debt to GDP ratio by Halloween – in 10 days time. Gold’s recent weakness has coincided with a period of dollar strength but with trade and budget account deficits as far as the eye can see, this dollar strength is likely to be brief. Indeed, the dollar’s recent strength is due to the fact that while the dollar’s fundamentals are very poor – its competing fiat currencies such as sterling and the euro have similar if not worse outlooks due to imprudent monetary policies. The possibility that gold could surge to as high as $10,000/oz is gaining traction amongst some respected market participants. Paul Brodsky, co-founder of QB Asset Management Company has again warned regarding the risks posed to US Treasuries and the possibility of a sharp revaluation of gold that could see gold reach $10,000/oz. A twenty-year veteran of the bond market in his own right, Brodsky told King World News that the US may return to some form of Gold Standard in order to restore faith in the US dollar. Proponents, including Steve Forbes and Ron Paul, argue a gold standard would prevent what they see as irresponsible money creation and force the US to live within its means by limiting the amount of money monetary authorities can create. The idea that the US could revalue gold and devalue the dollar (as was done by Roosevelt in the Great Depression) is gaining increasing currency. Gold prices would hit $10,000 an ounce or even more should current calls for a return to the gold standard become reality, according to Brodsky.